Willem passed away suddenly in Newcastle last year. He will always hold a special place in my memory and in the memory of members of the Newcastle Aphasia Group and the Newcastle Conversation and Aphasia Group. 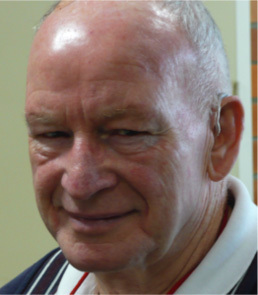 Willem joined the Newcastle aphasia groups towards the end of 2007. He had suffered a stroke that had left him with severe aphasia. He had come to Australia as a young man from The Netherlands and spoke both Dutch and English. After his stroke, he had great difficulty in both languages. However, this did not stop him from interacting and communicating with others. Willem was born and raised in The Netherlands during the Second World War. Life during that time was unbelievably tough for him as a teenager and his large family and many people were starving. He was sent to live on a farm in Belgium because he was suffering from malnutrition. Willem prided himself on being a handyman. We learnt that he had trained as a cabinet-maker and loved working with wood. He had worked in the building trade for most of his working life and always had projects on the go at home. Willem and his wife, Ailsa, loved travelling. In the group we were lucky enough to get updates on their wonderful trips all over the world. An account of their trip to Fiji was published in the AAA Newsletter (Winter 2012). Ailsa made those trips so special – I remember her selecting a cruise on a Dutch ship so that the staff could speak to Willem in his native language. In 2008, our group discussed the strengths everyone had. Willem’s strengths were described as being Patient, Honest, Caring, Hardworking, Friendly, Helpful and Courteous. How true this was! Despite his communication difficulties, Willem always arrived at the group with a warm smile that would cheer everyone up. He wanted others to know how difficult it was for him to communicate but, once this was done, his focus was always on other people. He was so thoughtful and considerate, constantly checking that everyone had what they needed. He was always ready to help with getting chairs, or handing round food or printed sheets and made sure no-one was left out. Thanks to Ailsa, he had a communication book giving his life story which he used to introduce himself – he always ensured that anyone new to the group had a chance to read it. Ailsa also compiled little books of their latest trips and he loved others to read these. He would monitor the book’s progress around the group to ensure that everyone had seen it. Although he could not easily participate, he was always interested in whatever was being discussed. Willem had a secret weapon – Ailsa. She has been unfailingly patient, positive, warm and caring with Willem and, thanks to her, he was able to participate in a wide variety of activities, including the aphasia group. Many of us involved in the group have been lucky enough to consider Ailsa as a friend. May this Navajo chant be true for Willem. My voice restore for me. In the white wings are the footsteps of morning.